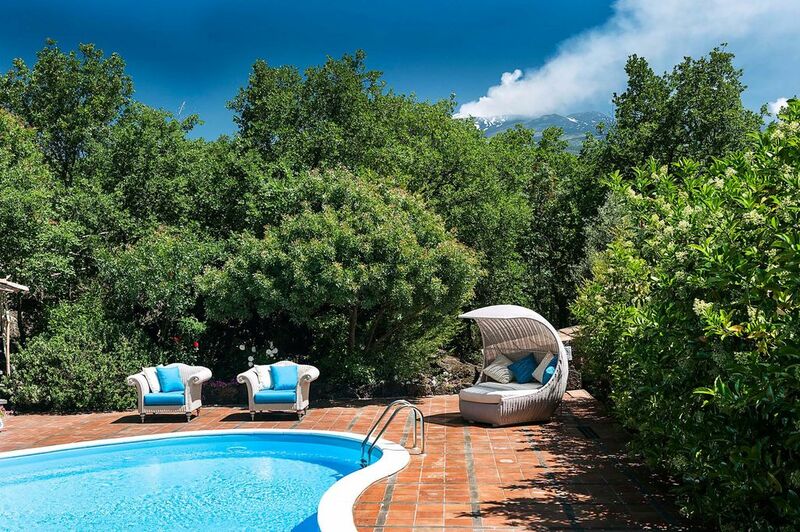 Villa dei Fiori is a beautiful dwelling with private pool in Ragalna, a characteristic village on the slopes of Mount Etna, Europe's highest and most active volcano, recently added to UNESCO's World Heritage list. Besides its lovely swimming pool, the villa offers a well-tended garden with lawn and a spacious veranda with kitchen and bbq, ideal for al fresco dining. Furnished in a delightful country style, the villa consists of a manor house, which is all on one level, and of an adjacent apartment, which is on the first floor and accessed via an external staircase. The manor house comprises a large living room, a dining room, a kitchen, two double bedrooms, of which one with en-suite bathroom, a twin bedroom and a bathroom. The apartment includes one room with a double bed, a single bed, a kitchenette and a bathroom. In the grounds, yet separate from the main house, there is a small, independent cottage where the owners live. The villa is also equipped with fireplace and central heating, internet Wi-Fi, satellite TV, washing machine and dishwasher. Villa dei Fiori is ideal for a large family or a small group of friends looking for a relaxing break, but with the chance to explore the local area. From the property can be easily reached, besides the other villages and natural beauties of the Etna Park, the most popular towns on the Ionian coast, such as Taormina, Catania and Syracuse. MANOR HOUSE G.F.: living room, dining room with fireplace, kitchen, 1 double bedroom with en-suite shower, 1 double bedroom, 1 twin bedroom, 1 bathroom-shower. APPARTMENT 1st F. (access via external staircase): open space with a double bed, a single bed, dining area and kitchenette, 1 bathroom-shower. OUTSIDE: porch with external kitchen, bbq and dining area, terrace, garden, swimming pool, sun terrace. Extra services (to pay on the spot): safety deposit euro 500 in cash, heating. If you are thinking of booking this house, just do it!! We had an exceptional experience here. The hosts are there if you need them but if not you don’t see them. Wewouod return in a heartbeat. Everything is as advertised. Perfect!! !